Today was going to be another ambitious day of high miles and lots of activities. While sitting over breakfast we were contemplating what was on our wish list of things to see and do, and the topic of penguins came up. When I had been researching the trip and where to stay, I discovered that New Zealand had penguins! At breakfast Catherine got on her phone and found a penguin tour that we could take that night out of Dunedin. It was going to be an action packed day. For most of the morning we enjoyed more green rolling hills with the local “wild” animals. I don’t think I have talked much about all the sheep and cows in New Zealand. 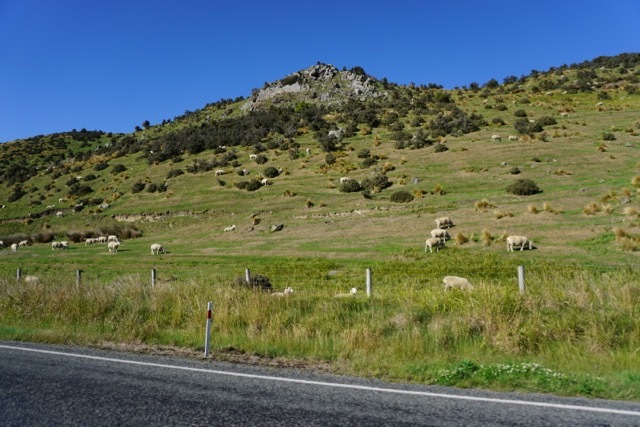 Fun fact: New Zealand has 6 sheep for every person, which is down from the high of 22 per person back in 1982. That’s a lot of sheep. Not only that but New Zealanders are also out numbered by cattle. We would be gifted with another day of hills dotted with sheep and cows as we meandered our way around and headed south. Ok, back to the trip. Our first official stop would be the Curio Bay and the Petrified Forest. 180 million years ago, some trees got buried by volcanic ash, and they were gradually exposed by the ocean. You can walk down from the upper cliffs to see the strange arrangement and patterns in the ground, as well as these enchanting little mini ecosystems that are formed by water being trapped in pools. You really had to pay attention to not walk right into these pools because the top looks like glass and their depth was deceiving. We also got the chance to see the mermaid hair seaweed up close. It is truly mesmerizing to watch it slowly move back and forth as the ocean waves some in and out of the small inlet. Later we found lunch at The Whistling Frog Cafe. After another delicious meal we continued and started making our way north again. Paul had been hinting about a destination that we might be able to see today. He wasn’t giving us any clues, but I thought I heard him say he wasn’t sure if it was open. When we got there it was such a fun surprise. We took a right turn onto a small gravel road that ran into a river and we showed up to the Tuapeka Ferry. Paul waved to the ferry captain who was on the other side of the river. He acknowledged and started to head over. Paul disclosed to us that he wasn’t sure if the ferry was running or if it would be open. We found out that it only runs from 8-10 am and 4-6pm. We got there about 5 min before 4pm. 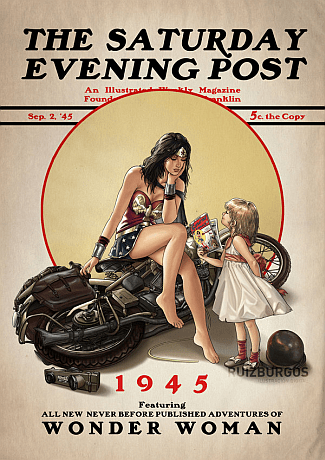 Talk about great timing again! Paul for the win! The ferry is hooked up with cables that cross the river, and uses water power to cross the river to ferry cars back and forth. On the way over the ferry stopped moving and the captain called out that he might be there for a while. Apparently the river is really low, and since he is just using rudders to steer and move, he was not getting any help at that moment. He finally made it over, ” I have some bad news and some good news. The bad news is if the river is below 300 cubic meters of water I’m not allowed to take vehicles on the ferry, and today it is running at 250. 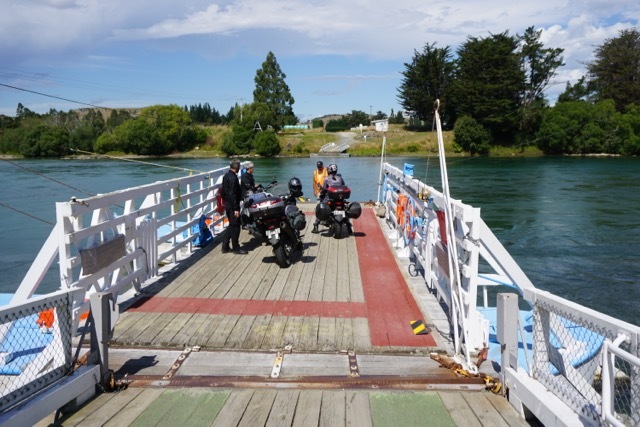 The good news is if you don’t tell anyone I won’t either.” We all laughed and proceeded to load our bikes on the ferry. He told us a little bit about the ferry and how it works, while we took pictures and looked at how low the water level really was. The historic ferry is over 100 years old, and is the only one of its kind in the southern hemisphere. It was fun chatting with our captain Terry, but it was time to continue. We made our way to Dunedin, where we would be staying the night with a friend of Paul’s, who was so graciously going to let us crash in his extra room. We did a quick drop off of our stuff, Paul borrowed his moms car, and dropped us off in downtown so we could grab dinner and wait for our tour van to pick us up. At the designated spot in The Octagon of Dunedin, a women approaches us to confirm we are on her tour. We hop into the van and proceed to drive down a two lane road, next to the ocean, without a guardrail, with a middle aged Filipino woman who asked us to be patient as this was her first time driving the tour. I completely thought she was serious but soon discovered she could give Formula One racers a run for their money. As we traveled along the extremely curvy and tight turns I planned how I would escape from the van if we were to go flying over the edge and plunge into the cold dark water below. We arrived safely at the end of the road and parked at the Royal Albatross Center, where we had time to walk around before the group lecture and tour of the night time arrival of the Blue Penguins. Walking around outside was like the Alfred Hitchcock movie The Birds. Hundreds, if not thousands of birds were everywhere. Flying, walking, sitting, squawking, and pooping. Yes, there was bird droppings everywhere. I was pretty sure we were not getting out of there without getting pooped on. 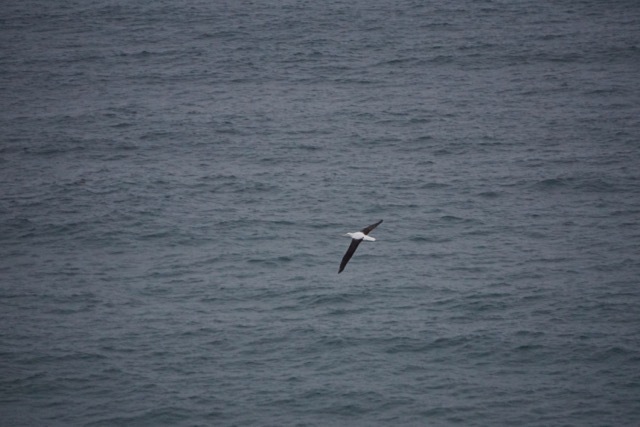 We walked out to the cliffs were we saw seagulls, Cormorants, Shags, seals in the water and on the rocks, and we were lucky to see an Albatross flying near the cliffs. Nighttime was the signal to start the penguin portion of the tour, and about 80 of us walked down a steep trail to a viewing platform where we were to wait quietly for their arrival. Around 10:30pm the first groups, which is called a raft, came out of the water. We witnessed many groups hop and waddle up the shore, then up the rocks to find their burrow where their chicks were waiting for them to bring back food. In the end the tour guides counted about 112 penguins. 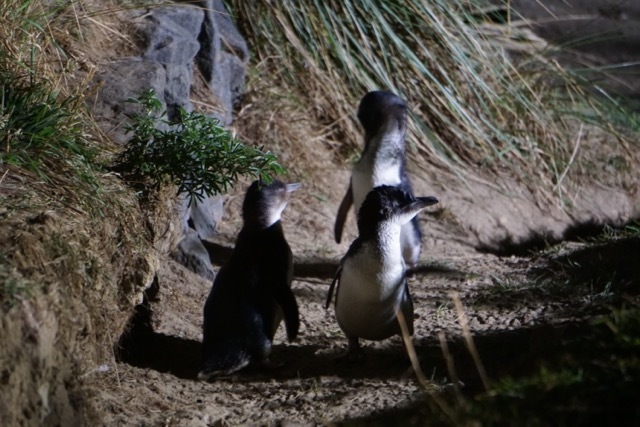 It was such a treat to see the little Blue Penguins, we were in cuteness overload. 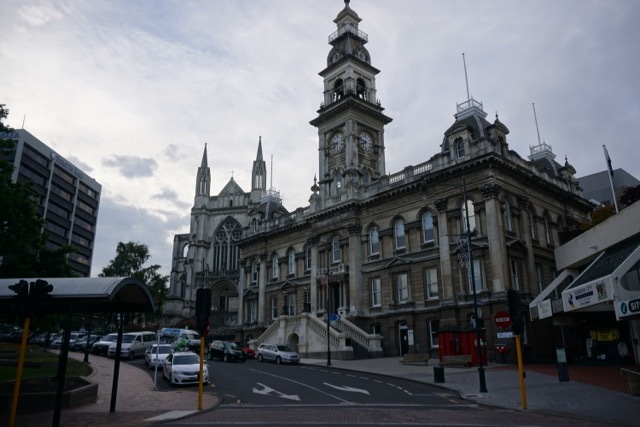 Our tour driver took us back to Downtown Dunedin, again using the road as her training grounds for a future in racing. I had to close my eyes a few times and go to my happy place. Again we arrived all in one piece at our destination where Paul and Catherine were waiting to pick us up. What a day! We slept great that night, dreaming about penguins and looking forward to another big day of riding.